Webster County at West Paducah Heath--It's going to be a long, sad trip home from West Paducah tonight, Trojans fans, so you might as well have some fun on the way over. Leave now, and you'll have plenty of time to enjoy the western half of Kentucky's U.S. 60 yard sale. Frankfort (AP A No. 2) at Paris--Roadtrip for Great-Great-Grandma. Harlan (AP A No. 10) at Hazard (AP A No. 7)--Hazard, the defending state champ, is 2-3. And now, writes John Middleton in The Harlan Daily Enterprise: "The talented Harlan senior class has been aiming to knock Class A power Hazard from atop the district since their sophomore season. That group will get one final shot on Friday." Hancock County at Owensboro Catholic (AP 2A No. 1)--The visitors were effectively ranked 11th in this week's AP 2A poll. Somerset (AP 2A No. 3) at Danville (AP 2A No. 2)--Game of the night in Kentucky? Erlanger Lloyd Memorial at Newport Central Catholic (AP 2A No. 8) on Saturday--NewCath, the 2010 state champ, is 2-4. And now, here come some 6-1 Juggernauts. Elizabethtown at Louisville Central (AP 3A No. 1)--Central, winner of four of the last five 3A state championships, is 5-1 with its only loss at 6A St. X two weeks ago. Paducah Tilghman (AP 3A No. 9) at Trigg County--If Tilghman struggles in Cadiz anywhere along the lines as it did last week at Fort Campbell, the Blue Tornado (winner of that odd 3A title in the last five years that Central didn't win but currently 4-3) might be on its way out of the AP poll. Corbin, which rolled, 64-6, at Stearns McCreary Central on Thursday night, was the 11th team in this week's poll, but the Redhounds are only 3-4. No. 13 Trigg County would be 5-2 win a win tonight, as would No. 12 Russell, with a victory over Mason County. 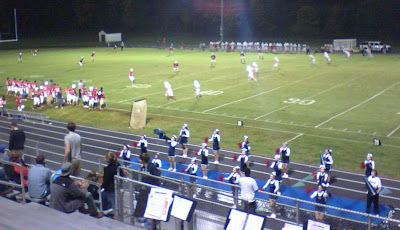 Pendleton County at Fort Thomas Highlands (unanimous AP 4A No. 1)--Highlands, winner of the 4A state title last season, the four 5A crowns before that and a bunch of 3A and 2A championships before then, is amazing. Louisville Trinity (unanimous AP 6A No. 1) at Louisville duPont Manual--Steadily roll the 'Rocks, winners of four of Kentucky's five 6A football titles. Henderson County (AP 6A No. 8) at Daviess County--Henderson County coach Clay Clevenger, to Kevin Patton of The Gleaner: "It's one of those things, the more you talk about it the more the players start thinking about it. If we put the ball on the ground in practice, sometimes I might blow up about it, but other times I just act like I didn't see it." Lexington Bryan Station (AP 6A No. 10) at Lexington Paul Dunbar--The visitors replaced Louisville Ballard in this week's Class 6A Top 10, but then Ballard went out last night and got an upset win at No. 5 Eastern. Owensboro at Calloway County--Calloway County star runner Stephen Treadaway to Jack Kees of the Murray Ledger & Times: "Since Owensboro beat Lone Oak, that put a whole new spin on things, as far as Lone Oak not being the glorified team and everything, and it’s just a whole new ballgame for everyone, everyone has a chance this year and we hope that we get it." Madisonville-North Hopkins at Mortons Gap Hopkins County Central--A couple of pictures from last week's CHS loss to visiting Calloway County. The nachos looked better than the game. Lots, too, idling this week, including Mayfield (AP A No. 1), Russellville (AP A No. 8), Glasgow (AP 2A No. 9), Caldwell County (AP 2A No. 10), Breathitt County (AP 3A No. 2), Fort Campbell (AP 3A No. 6), Covington Catholic (AP 4A No. 3), Russell County (AP 4A No. 4), Barbourville Knox Central (AP 4A No. 5), Bowling Green Warren East (AP 4A No. 7), Boyle County (AP 4A No. 8), Lone Oak (AP 4A No. 10), Bowling Green (AP 5A No. 1), Bowling Green Warren Central (AP 5A No. 3) and Bowling Green Greenwood (AP 5A No. 9). Mike Marsee in Danville's Adovcate-Messenger: "Sam Harp said open dates aren’t always beneficial, but he’s pretty sure this one has done Danville some good ..."
Tom Rogers at WKDZ in Cadiz: "The Trigg County Wildcats are gearing up for a huge district showdown tonight at Perdue Field as they host Paducah Tilghman. The Wildcats are coming off a 35-0 district win last week at Webster County. A win tonight would go a long way towards giving Trigg a home game in the first round of the high school football playoffs. Coverage of Trigg County against Paducah Tilghman gets underway at 6:00pm on WKDZ 106.5 and wkdzradio.com. And don't forget the big John Maison 'Tailgate' concert at the stadium at 6:00. "The Fort Campbell Falcons are in the driver's seat for the top seed in the district after last Friday's impressive win over Paducah Tilghman. The Falcons jumped out to a 27-0 first quarter lead and never looked back, in rolling to a 43-14 win. The Falcons go into their bye week tonight with an overall record of 5-2, and 2-0 in the district. If the Falcons pick up the win next Friday at Webster County, they would clinch the top seed in the district, and guarantee that at least their first two playoff games would be at Fryar Stadium." John Hardin is shooting for a third-straight shutout. Ben Montgomery, a senior at Christian Academy of Louisville, is in the clubhouse at 1-under at the KHSAA boys' golf tournament at Bowling Green Country Club. Kyle Jury from Elizabethtown and Seth Powell from Paducah Saint Mary are tied with him, but they're both still on the course. Can only imagine just how happy the ride home to Tompkinsville was Thursday evening after Monroe County's 41-0 rip of Bowling Green South Warren and the appearance of this headline in the Thursday Bowling Green Daily News: "South Warren expects challenge from Monroe County offense." Hens! Colonel Football is on the air! Join us for the pregame right now on 860 AM, 96.5 FM, or online at wsonradio.com! The good thing about good rivalries is that they tend to go back and forth over a period of years. One team will seem to be getting the better of the other for a few years, and then the second team will turn things its way for a while. So it is with the Danville-Somerset rivalry, a hundred-year war (at least) that has certainly seen its share of swings over the years and decades. And the momentum currently sits with Somerset, which has won four straight games against Danville over the last three years, including regular-season and playoff games last year when the teams were placed in the same Class 2A district. 7-6, Tilghman, at Trigg County ... "Trigg is hanging around here. We've got to get some points. This game will not end 7-6," says a WKDZ announcer. I wonder if my main man, Darius Miller, tuned in from New Orleans to Maysville's WFTM to hear this one tonight: Mason County 32, Russell 28. 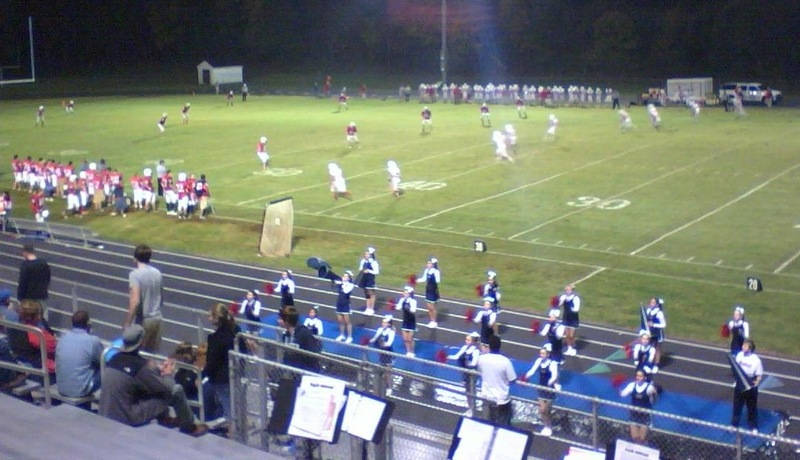 The Royals trailed, 28-10, after three quarters, per WTFM sports director Danny Weddle. Channel 6 reports that Heath led Webster County, 7-6, in second quarter! One WKDZ guy: "Trigg will now have to get on the Google and figure out where South Warren is." Another: "I thought we had been there before, but we hadn't. That was East Warren." Final in Cadiz: Tilghman 21, Trigg County 7. WKDZ says this was the first time Tilghman had ever played in Cadiz. Final was 21-6, not 21-7. Harlan (AP A No. 10) at Hazard (AP A No. 7)? Hazard, 56-19, over Harlan. Nice win for the defending state champs. WKDZ IS REPORTING THAT HEATH HAS DEFEATED WEBSTER COUNTY! Greenup County at Paintsville Johnson Central (AP 4A No. 9)? Johnson Central, 59-12 over Greenup. Jeffersontown at Elizabethtown John Hardin (AP 5A No. 2)? But John Hardin was leading big in the first half. Louisville Trinity (unanimous AP 6A No. 1) 55 at Louisville duPont Manual 27 ... local radio station plays "We Will Rock You" on Trinity scores. Per Ann Beckett in the Marshall County Daily: Things looked bad for the Marshals when a penalty gave visiting Muhlenberg County a first down after a third-and-24 with about three minutes to go in Draffenville and the home team trailing, 16-13. Then Noah Steele caught three straight passes for Marshall County and intercepted one of Muhlenberg's, and the Marshals had prevailed with a 20-16 win. Danville's 1962 and '87 champs will be honored at the state championships. The Twitter desk today announces intention to follow Highlands' OZone student section. Love it when Murray's coach calls Crittenden County "a classy team with a classy coach." NewCath, once 1-4, is heating up. Heath 28, Webster County 6! Paris plays at Blanton Collier Stadium. Richard Skinner reports in The Kentucky Enquirer that Walton-Verona has a defensive back, Tyler Cornelison, who is playing out his senior season with the Bearcats despite a torn anterior cruciate ligament. In Friday's 42-6 win over Gallatin County, Cornelison intercepted two passes and returned one for a touchdown. Walton-Verona is 5-2. Tickets are on sale for Tilghman's "Push for the Playoffs Pancake Breakfast."